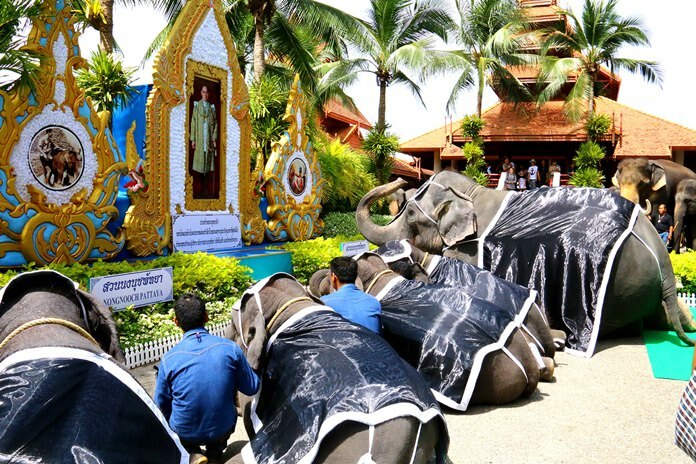 Nong Nooch Tropical Garden paid tribute to HM the late King with an elephant merit-making ceremony. Director Kampol Tansajja along with managers, staff and a mix of tourists joined in the Oct. 22 event at park’s Wiwat Restaurant. Nine elephants, led by 25-year-old Bird, one of the oldest pachyderms at the park, took part in the procession. Kampol said the tribute would be a great way to show loyalty to the late monarch since elephants are signature animals of Thailand and are well-trained to partake in any activity. Kampol added that everyone at Nong Nooch was saddened by the great loss of HM the King. Today they wanted to pay tribute and join in the mourning with employees and tourists alike. Nong Nooch Garden has also opened a book of condolences for those who wish to pay tribute, available every day from 8 a.m. to 6 p.m.